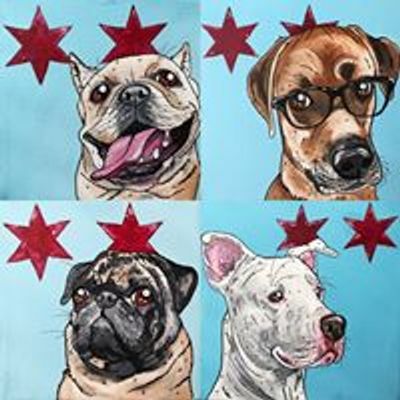 We love partying with the Real Dog Moms of Chicago! Aided by our fun-loving instructors, create an original masterpiece of your pet, all while enjoying food and drinks! 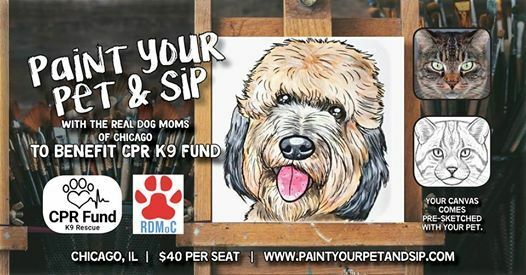 For this class, we are donating a portion of every ticket to the CPR Fund K9 Rescue. Whether you have a cat, dog, bird, or lizard- come join us crazy dog moms (and dads!) 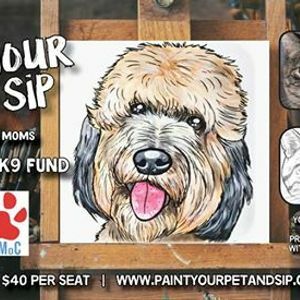 as we paint masterpieces of our pets while supporting a great cause. One pet per canvas. All skill levels are welcome! 1. A pre-sketched canvas of your pet if you email us a photo of your pet AT LEAST 2 days before class (one pet per canvas only). 2. All art materials provided. 3. An introductory paint tutorial and 3 hours of painting. The CPR Fund K9 Rescue is dedicated to ending the needless euthanasia of adoptable pets. Our all-volunteer network of administrative personnel, transporters, event planners, grant writers and, last but certainly not least, foster families works tirelessly to decrease the euthanasia rate in northwest Indiana and the Chicagoland area. Once you have purchased your ticket, please email one 'clear' photo of your pet and a copy of your ticket to cGFpbnR5b3VycGV0YW5kc2lwcnN2cCB8IGdtYWlsICEgY29t. Head shot or face photos will work best. Please include any names of guests you'd like to sit with during class. -We take RSVP's up to 48 hours before the class. -No outside food or drinks. Minimum one drink purchase per guest. -No pets at the actual event. -All tickets are final sale. Please double check the date, time & location before purchasing. If you need to reschedule, please check our homepage for other available classes. National Lawyers Guild & Latino Union May Day Party! Quit Your Job and Follow your Dreams? Only Chicago date in 2019!